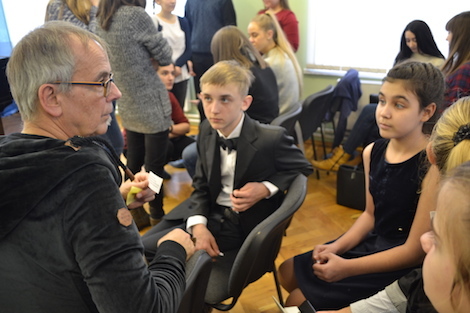 January 24, 2018: The 6th edition of the traditional international meeting of school students was held in the Department for Foreign Literature of Taganrog Chekhov Public Library, which is located in the historical building of Tchaikovsky House. The event was organized within the framework of the cultural exchange program between the sister cities of Taganrog and Lüdenscheid. The topic of is year's meeting was dedicated to profession selection. The organized "Career fair" was aimed to provide vocational guidance. 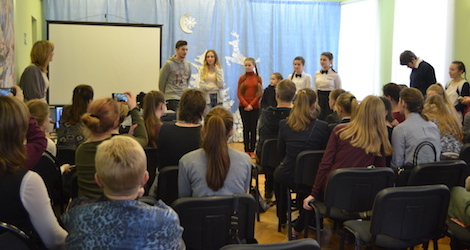 The meeting was spiced up by participation of school students of Lenin High School from a remote area in Belaya Kalitva district of Rostov Oblast. The students were divided into three groups, each with a teacher and a student from Lüdenscheid's Adolf Reichwein Gesamtschule for joint execution of some tasks. All three groups introduced their mini-presentations of a profession. The kids had a great opportunity both to communicate with their peers from Germany and to display their teamwork skills. The meeting was concluded by a powerful performance of the guests from Belaya Kalitva District. The school students from Lüdenscheid and their teachers received souvenirs handmade by their Russian counterparts.